Each year, when I make the pilgrimage to the Getty Villa for their annual theater production, it's hard not to contemplate theater's relationship to the other arts. Here, walking through the Villa before the show, you're surrounded by works of sculpture centuries old. Their original audience an ocean away and long since dead. Yet, they have - as the cliche goes - stood the test of time. Even in an empty gallery, these sculptures and urns remain works of art - immune to the need of audience. Not so for the theater. It's why theater is so often at the bottom of the artistic hierarchy. Theater is seemingly inextricably bound to its audience and too often a slave to its time. After all, a play without an audience isn't art - it's rehearsal. Most years, my philosophical lamentation at theater's place usually ends with a quick walk through the Villa's spectacular herb garden. I embrace the theater's dependency on audience and patiently take my seat in the outdoor amphitheater. 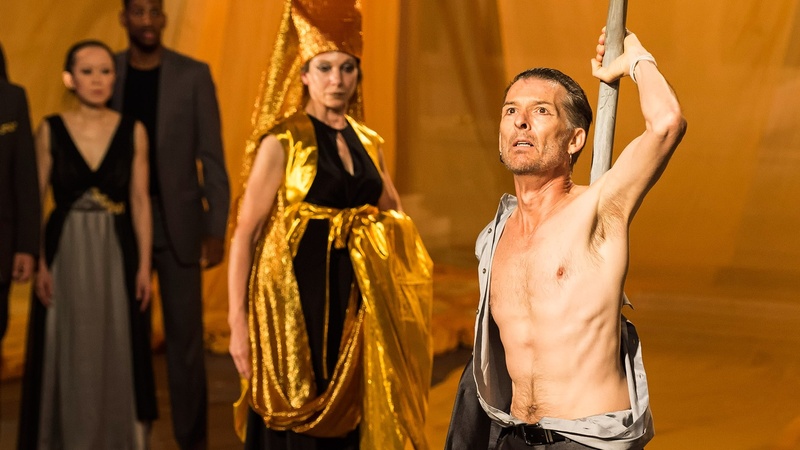 This year, the Getty has wisely chosen to bring back New York's SITI Company, led by artistic director Anne Bogart, to resurrect Aeschylus' The Persians. It's a choice, and a company, that throws that hierarchy into question. The Persians is a tough play both structurally and thematically. Aeschylus' oldest surviving tragedy, its inciting incident is the actual defeat of the invading Persians by a smaller Greek force less than 10 years before the play was written. Aeschylus writes not a triumphal celebration of the Greek victory, but a play set entirely in the Persian court - anxiously awaiting news from the battle. Even as the play catalogues the names of those who fought - not a single Greek is mentioned. From the beginning, this play had a challenging relationship to its audience. The reason to go - as if we needed an excuse to spend an evening outdoors in a Malibu Canyon - is to see the SITI Company's work. What you'll be struck by is something all too rare and assumed in the theater - technique. It's apparent from the opening, these are actors who can command space. The Getty Villa's amphitheater for all its charm, is a notoriously challenging place to make theater. More than once, I've seen a play dwarfed by its architecture; actor's presence and voice swallowed by its expanse. Wisely the Getty seems to have realized the caliber of artist required. Where Travis Preston's successful production of Prometheus Bound last year chose to compete with the space scenically, Anne Bogart chooses instead to make the human form a sculpture powerful enough to inhabit it. You'll experience it in the Laocoön-ian contrapuntal form that actor Will Bond assumes as the messenger while recounting the horrors of war. An oar held behind his back by an upstretched arm, his bare chest almost flayed open by both words and form - here is a living statue . . . but one that rather than remaining silent - gives breath to the past. The Persians is not an easy play and SITI is a complicated company, but if you're up for a work that challenges an audience rather than being dependent on it - it's a remarkable journey. The Persians plays at the Getty Villa in Malibu weekends through September 27th. Running time: 90 minutes without an intermission.